Students earning an online master’s in supply chain management can enter a fast-growing field that offers lucrative salaries and intriguing work. According to the Bureau of Labor Statistics (BLS), transportation, storage, and distribution managers earn a mean annual wage of $97,630. Careers like logisticians, industrial engineers, and operations research analysts are also growing at faster rates than the national average. Not only can you earn a strong wage by working in supply chain management, you can also gain exposure to many facets of business such as sourcing and sales. Plus, as a supply chain management professional, you’ll build skills in communication, analysis, and problem solving, all of which can serve you well throughout a business career. What Else Can I Expect From an Online Master’s in Supply Chain Management Program? University of North Carolina at Chapel Hill ranks #1 on The Best Online Master’s in Supply Chain Management Programs! UNC offers an online MBA with a concentration in global supply chain management. The program prepares students for careers in operations management, logistics, process improvement, and in related positions. Required courses are available entirely online, and the program requires no campus visits. Students begin with core classes covering analytical tools and operations management. Elective options include courses in modeling, project management, data analysis, and managing supply chains on an international scale. This online master’s in supply chain management is ideal for working professionals who want to advance their careers. The synchronous online courses are taught by the same experienced instructors who teach on campus. Distance learners communicate with peers and instructors using the online learning platform. Applicants with seven or more years of relevant professional experience do not need to supply GRE or GMAT scores. All applicants must have at least a bachelor’s degree and must submit official transcripts. The University of North Carolina at Chapel Hill is regionally accredited by the Southern Association of Colleges and Schools Commission on Colleges (SACS). UNC offers the online master’s in supply chain management program through its business school, which holds accreditation from the Association to Advance Collegiate Schools of Business. University of Southern California ranks #2 on The Best Online Master’s in Supply Chain Management Programs! USC’s online master’s of science in global supply chain management is a 27-unit program. Students have access to a variety of resources, including online office hours with instructors and networking opportunities with industry leaders. While all classes are available online, students can schedule monthly in-person meetings with professors to discuss course content, assignments, and exams. The master’s in supply chain management online program follows a prescribed course order. The first semester includes fundamental classes in operations management, supply chain management, and global supply chains. Advanced coursework concentrates on issues such as sustainability, supplier management, and the application of Lean Six Sigma. Students graduate within 16 months and take 12 classes, including one summer course. Applicants must have a bachelor’s degree from an accredited institution and must meet minimum GRE or GMAT scores. Applicants must demonstrate intellectual promise through a strong undergraduate GPA and must have at least three years of work experience. All graduate students pay the same tuition rate, regardless of residency. The University of Southern California is regionally accredited by the WASC Senior College and University Commission. The Marshall School of Business is accredited by the Association to Advance Collegiate Schools of Business. University of Nebraska Lincoln ranks #3 on The Best Online Master’s in Supply Chain Management Programs! Nebraska offers a supply chain management specialization that helps students understand global issues, trends, challenges, and technologies affecting the industry. Students hone skills in planning, purchasing, customer service, and distribution. Coursework in the online supply chain management master’s program covers topics including lean business practices, advanced enterprise management, project management, data mining and warehousing, and logistics management. All classes are available online, but students can take some on-campus courses. The average age of an MBA distance learner at Nebraska is 32, and students enter the program with undergraduate degrees in a variety of areas, including business, engineering, journalism, and the liberal arts. Applicants must have a bachelor’s degree and a minimum 3.0 GPA. Applicants must submit GRE or GMAT scores, unless they have seven or more years of managerial experience or hold a doctorate, law, medical, or pharmacy degree. All applicants must submit three references, a personal statement, a resume, and proof of at least one year of professional experience. The University of Nebraska–Lincoln is regionally accredited by the Higher Learning Commission (HLC). The business school is accredited by the Association to Advance Collegiate Schools of Business International. University of Washington ranks #4 on The Best Online Master’s in Supply Chain Management Programs! The University of Washington offers a fully online master’s of supply chain transportation and logistics. The program helps established professionals advance their careers by obtaining knowledge of critical industry issues. Part-time students typically complete the program within two years. All classes are available online, though students must participate in a one-week, on-campus residency before beginning coursework. Students pursuing a supply chain management master’s degree online complete coursework aligning with the current changes and emerging technologies affecting global logistics professionals. Students take classes in cohorts of about 30 learners, which creates opportunities to network with peers. Applicants must have a bachelor’s degree from a regionally accredited institution, a minimum 3.0 GPA in their last 60 undergraduate credits, and sufficient English proficiency exam scores. Applicants should also have completed undergraduate calculus or statistics; they do not need to submit GRE or GMAT scores. All online students pay the same tuition rate, regardless of residency. Students earning the online master’s in supply chain management have access to resources including a digital library, financial aid assistance, IT help, a career center, and legal services. The University of Washington is regionally accredited by the Northwest Commission on Colleges and Universities (NWCCU). University of Maryland ranks #5 on The Best Online Master’s in Supply Chain Management Programs! UMUC offers an online master’s degree in management with a specialization in acquisition and supply chain management. The program provides supply chain professionals with the knowledge, skills, and training necessary to succeed in logistics and procurement. Students have access to a variety of networking opportunities. The 36-credit master’s in supply chain management online program includes courses examining the legal structures affecting private and public acquisition processes. Students learn how to use technology to facilitate sustainable and efficient supply chains. Distance learners also project future changes to the industry and explore cost analysis, strategic purchasing, material flow optimization, and negotiating procurements. UMUC’s streamlined admissions process does not require applicants to submit GRE or GMAT scores. Applicants must have a bachelor’s degree from a regionally accredited institution and must submit college transcripts. The university charges per-credit tuition, and Maryland residents pay a discounted rate. Students can work with a financial aid counselor to explore funding options; UMUC awards more than $6 million in scholarships each year. The University of Maryland University College is regionally accredited by the Middle States Commission on Higher Education (MSCHE). Lehigh University ranks #6 on The Best Online Master’s in Supply Chain Management Programs! Based in Bethlehem, Pennsylvania, Lehigh University offers a master’s of business administration with a specialization in supply chain management. Students in the flexible, part-time program can take all required classes online. Coursework explores a variety of industry issues and concepts that affect companies' global supply chain operations. The specialization requires nine credits, in addition to the 27 credits necessary to earn the MBA. Specialization courses include strategic supply management, transportation and logistics management, and demand and supply chain planning. Applicants to the online master’s in supply chain management program must have a bachelor’s degree from an accredited college or university and must submit GRE or GMAT scores, a personal essay, two letters of recommendation, and a resume. Applicants must have at least two years of professional experience and may need to interview with program staff. All students in the online MBA program pay the same tuition rate, regardless of state residency. Lehigh University is regionally accredited by the Middle States Commission on Higher Education (MSCHE). The College of Business and Economics is accredited by the Association to Advance Collegiate Schools of Business International. Rutgers University ranks #7 on The Best Online Master’s in Supply Chain Management Programs! Based in New Brunswick, New Jersey, Rutgers offers a 30-credit MS in supply chain management that helps professionals advance their careers. Students can complete the degree entirely online, and most learners graduate in one year. The program requires courses in marketing research, global procurement and supply management, risk and disruption management, and global logistics management. During a course in demand management, students learn to apply forecasting models and methods to the supply chain process and explore business activities including sales, marketing, operations, and finance. Students learn how supply and demand affects inventory management and production planning. Applicants to the supply chain management master’s degree online program must submit official transcripts and GRE or GMAT scores. Non-native English speakers must demonstrate language proficiency through TOEFL exam scores. Applicants must submit three letters of recommendation, a resume, and a personal essay. The program accepts applications on a rolling basis and offers three start dates per year. In-state and out-of-state students pay the same per-credit tuition rate. Rutgers University is regionally accredited by the Middle States Commission on Higher Education (MSCHE). The Rutgers Business School is accredited by the American Association of Collegiate Schools of Business. Michigan State University ranks #8 on The Best Online Master’s in Supply Chain Management Programs! Located in East Lansing, Michigan State offers an online MS in supply chain management that provides students with an understanding of strategies, technologies, and best practices necessary to succeed in the field. The curriculum features cross-functional courses that incorporate issues and concepts from the global business world and prepare students for diverse career paths. While most courses are available online, students must attend some in-person, three-day weekend sessions. Students complete 36 credits and typically graduate within two years. The program is ideal for professional supply chain managers and executives planning to pursue advanced positions. Students take courses in cohorts and progress through the program with a small group of peers. Students begin with courses in global supply chain management and logistics; later coursework covers topics including distribution fulfillment, manufacturing planning and control, strategic sourcing, and change management. Applicants must have a bachelor’s degree, a minimum 3.0 cumulative undergraduate GPA, and at least two years of professional experience. Applicants also submit a resume, two personal statements, and three letters of recommendation. Michigan State University is regionally accredited by the Higher Learning Commission (HLC). Oregon State University ranks #9 on The Best Online Master’s in Supply Chain Management Programs! Oregon State University offers a master’s in business administration with a supply chain and logistics management track. Students in the program master global operations and supply chains through primarily online coursework. Distance learners must complete a few courses at Oregon State’s Portland extension campus. The supply chain management online program requires courses in managerial decision tools, markets and valuation, corporate finance, advanced strategic management, and ethics and corporate social responsibility. The program emphasizes ethical, lawful, and environmentally responsible practices and prepares students to apply quantitative and qualitative methods for sound decision-making. Elective options include courses in project management, data analytics, and business technology law. Students can pursue a 60-credit MBA or a 45-credit accelerated MBA. Applicants must have a bachelor’s degree and must submit college transcripts and GRE or GMAT scores. They must answer a series of questions and provide several references. Oregon State does not require applicants to have formal professional experience. All online students pay the same tuition rate, regardless of state residency. The university offers several scholarships and fellowships. Oregon State University is regionally accredited by the Northwest Commission on Colleges and Universities (NWCCU). Boston University ranks #10 on The Best Online Master’s in Supply Chain Management Programs! Boston University’s master’s of science in supply chain management provides a comprehensive review of the development, execution, and operation of global supply chains. Coursework covers risk management, import and export operations, and lean production. Graduates contribute to businesses and organizations by using creative solutions to improve processes and operations. The program offers specializations in global business, logistics management, and quantitative approaches. Core courses include financial concepts, global supply chains, business process fundamentals, and quantitative and qualitative decision-making. After completing 16 core credits, students begin concentration courses and electives. The program culminates in a capstone project, during which students apply learned knowledge to a supply chain and logistics problem. Students can take classes entirely online or in a blended format. Most students complete the 40-credit program in 18 to 24 months. Applicants must hold a bachelor’s degree from an accredited institution and submit three letters of recommendation and a personal essay. Applicants do not need to submit GRE or GMAT scores; admissions decisions are based mainly on each applicant’s previous academic performance. Boston University is regionally accredited by the New England Association of Schools and Colleges, Commission on Institutions of Higher Education (NEASC-CIHE). The online master’s in supply chain program holds accreditation from the Association to Advance Collegiate Schools of Business. Quinnipiac University ranks among The Best Online Master’s in Supply Chain Management Programs! Located in Hamden, Connecticut, Quinnipiac University offers a 46-credit MBA in supply chain management that helps students build the skills and knowledge they need to advance in this evolving industry. Core classes emphasize sound decision-making, especially in regards to process development, accounting, organizational leadership, and business operations. Students also take courses in finance, marketing, managerial economics, and information systems strategies. A course in strategic sourcing and supply management explores the industrial purchasing cycle related to raw materials, operating supplies, and services. Students in the online supply chain management master’s program learn to use analytical models to improve the decision-making process. The program culminates in a three-credit capstone during which students examine theories and concepts relevant to supply chains. The program covers several topics, including the development of competitive strategies, internal and external firm analyses, and management leadership. Most students complete the program within two years. Applicants must submit three letters of recommendation, a resume, a personal essay, and GRE or GMAT scores. However, the business school may waive the standardized test score requirement for applicants with significant professional experience. Applicants must have a bachelor’s degree from an accredited institution. Quinnipiac University is regionally accredited by the New England Association of Schools and Colleges, Commission on Institutions of Higher Education (NEASC-CIHE). The university’s business school is accredited by the Association to Advance Collegiate Schools of Business. Pennsylvania State University-World Campus ranks among The Best Online Master’s in Supply Chain Management Programs! Penn State’s World Campus offers an entirely online master’s of professional studies in supply chain management that prepares students to design and manage supply chains, conduct in-depth analysis, engage in forecasting and planning, and use financial metrics to understand the implications of different strategies and methods. Most students require two years to complete the 30-credit master’s in supply chain management online. During their first year, learners take courses in business ethics, demand fulfillment, supply management, and financial analysis. Advanced courses explore topics like supply chain design and strategy, supply chain analysis, manufacturing and service operations, and strategic procurement. Applicants must have a bachelor’s degree from a regionally accredited institution or its international equivalent. They must have at least two years of professional experience and must submit transcripts, two letters of recommendation, a personal statement, and a current resume. Applicants without significant professional experience must submit GRE or GMAT scores. Distance learners have access to several resources, including career counseling, technical support, academic advising, and online tutoring. In-state and out-of-state students pay the same tuition rate. Northeastern University ranks among The Best Online Master’s in Supply Chain Management Programs! Based in Boston, Massachusetts, Northeastern University offers an online MBA with a concentration in supply chain management. The curriculum comprises 50 credit hours, including core and elective courses; students gain a strong business foundation before progressing to concentration coursework. Students earning the online master’s in supply chain management explore the transportation industry, strategic sourcing, and operations and sustainability. Supply chain management students can pursue a dual concentration in finance, healthcare management, marketing, international management, technology management, innovation entrepreneurship, or sustainability. Applicants must have a bachelor’s degree from an accredited institution and a minimum 3.0 cumulative GPA. They must be currently employed and have at least five years of professional experience, ideally in a management role. Applicants must submit a resume, a personal essay, and two letters of recommendation. Northeastern does not require GRE or GMAT scores, but applicants may include test scores to strengthen their application. Scholarship and funding opportunities available to online MBA students include the Double Husky Scholarship, the Parent and Family Scholarship, and the Edge Grant. All online graduate students pay the same tuition rate, regardless of residency. Northeastern University is regionally accredited by the New England Association of Schools and Colleges, Commission on Institutions of Higher Education (NEASC-CIHE). The D’Amore-McKim School of Business is accredited by the Association to Advance Collegiate Schools of Business. Louisiana State University ranks among The Best Online Master’s in Supply Chain Management Programs! Located in Baton Rouge, LSU’s online master’s of business administration program offers a specialization in supply chain management. Students take business classes in areas such as financial management, statistics, information systems, cost management, and marketing administration. The specialization requires a seven-week supply chain management course. Most students complete the 42 required credit hours within 18 months. MBA students must maintain a 3.0 GPA and may count no more than two grades of C or lower toward graduation requirements. Distance learners have access to financial aid assistance, a digital library, academic advising, and career services. All online students pay the same tuition rate, regardless of residency. Applicants to the online supply chain management master’s program must have a bachelor’s degree from an accredited college or university, a minimum 3.0 cumulative GPA, and at least three years of professional experience. Applicants without three years of experience must submit GRE or GMAT scores. All prospective students must submit two letters of recommendation and a statement of purpose. Louisiana State University is regionally accredited by the Southern Association of Colleges and Schools Commission on Colleges (SACS). The E. J. Ourso College of Business is accredited by the Association to Advance Collegiate Schools of Business. Duquesne University ranks among The Best Online Master’s in Supply Chain Management Programs! Duquesne University, a private Christian school in Pittsburgh, Pennsylvania, offers an MS in supply chain management in a blended format. The program combines online learning with some in-person sessions to balance flexibility and individualized instruction. Duquesne’s Center for Excellence in Supply Chain Management makes the university a national leader in research and collaboration. Most students complete the online master’s in supply chain management program in fewer than two years. The 30-credit curriculum leads to the Six Sigma Yellow Belt and American Production and Inventory Control Society certifications. Students take classes in managing inventory, demand management, and global fulfillment. The program culminates in a capstone experience that incorporates sustainable supply chains and strategic supply chain management. Applicants must have at least three years of professional experience; those with a bachelor’s degree in business administration must have only one year of professional experience. Applicants must submit transcripts, GRE or GMAT scores, two professional references, and a personal essay. Duquesne University is regionally accredited by the Middle States Commission on Higher Education (MSCHE). The university’s business school holds accreditation from the Association to Advance Collegiate Schools of Business International. University of West Florida ranks among The Best Online Master’s in Supply Chain Management Programs! Based in Pensacola, the University of West Florida offers an online MBA with an emphasis in supply chain logistics and management designed for both established professionals and students who are new to the field. Distance learners examine business problems and develop sound solutions. The program prepares students to use strategic processes to enhance supply chain and logistics management. During a required course in strategic management and policy formulation, students examine case studies to understand business management practices at different levels within an organization. A course in global logistics management explores facilities operations, import and export processes, raw material and finished goods movement, and the technologies impacting global supply chains. The curriculum also covers managerial economics, information resources, business and public policy, and logistics systems and analytics. Applicants to the online supply chain management master’s program must have a bachelor’s degree, should have a minimum 3.0 undergraduate GPA, and must submit two letters of recommendation and a resume. Those with at least a 2.75 GPA must have eight or more years of professional experience. Applicants with an undergraduate GPA below 3.25 or who lack adequate professional experience must submit GRE or GMAT scores. All online students pay the same tuition rate, regardless of state residency. Distance learners have access to student services including a digital library, technical assistance, and online tutoring. The University of West Florida is regionally accredited by the Southern Association of Colleges and Schools Commission on Colleges (SACS). Indiana University - Bloomington ranks among The Best Online Master’s in Supply Chain Management Programs! Based in Bloomington, Indiana University offers an MS in global supply chain management that prepares students to maximize revenue and profitability in a complex global business world. The curriculum emphasizes material sourcing, accounting, operations management, distribution, and inventory management. While all classes are available online, students must attend a one-week, in-person session each year. Students can complete the 30-credit master’s in supply chain management online in as few as 15 months; however, most learners require two years. During the first year, students take courses in sustainable operations, project management, enterprise operations, and sourcing. Students complete three courses during the second year: strategic marketing management, financial management, and operations management. Students can pursue dual degrees in supply chain management and either business analytics, finance, IT management, strategic management, entrepreneurship, or marketing. The business school bases admissions decisions on academic records, GRE or GMAT scores, professional and leadership experience, letters of recommendation, and a personal statement. Applicants must have at least a bachelor’s degree from an accredited institution and must demonstrate academic and professional competencies. In-state and out-of-state students pay the same tuition rate. Indiana University is regionally accredited by the Higher Learning Commision (HLC). The Kelley School of Business holds accreditation from the Association to Advance Collegiate Schools of Business. University of San Diego ranks among The Best Online Master’s in Supply Chain Management Programs! The University of San Diego’s MS in supply chain management is a completely online program developed for managerial and executive-level professionals. Graduates are prepared to identify gaps in an organization’s processes, apply project management techniques to address them, and efficiently lead teams of professionals. Students earning the supply chain management master’s degree online complete 36 credits. Most students graduate within 25 months. Most classes are available online, but students must attend a three- to four-day session on campus at the beginning of each semester. These sessions provide opportunities for students to interact with peers and instructors. The program culminates with a custom project during which students apply learned skills to solve a problem in the field. The project incorporates concepts such as leadership, change management, project management, and ethics. Applicants must have at least two years of relevant work experience, a bachelor’s degree from an accredited institution, and a minimum 3.0 undergraduate GPA. Applicants must submit a statement of purpose, two letters of recommendation, a current resume, and college transcripts. The University of San Diego is regionally accredited by the WASC Senior College and University Commission. The supply chain management program is accredited by the Chartered Institute of Purchasing & Supply. North Dakota State University ranks among The Best Online Master’s in Supply Chain Management Programs! NDSU offers a master’s of managerial logistics that prepares students to address global business and logistics challenges. The program’s interdisciplinary approach is ideal for both established professionals and students without significant experience. The 35-credit curriculum covers a variety of topics, including supply chain optimization, enterprise resource planning, remote sensing, transportation analysis, and emergency management. Most full-time students graduate within two years. A unique course in urban transportation systems analysis explores tools and methods used in urban transportation. Students apply traffic forecasting and examinations of system capacities to project the supply and demand of transportation networks. A course in transportation systems security covers security systems and threats impacting transportation, including highway, maritime, railroad, and air transportation. The online master’s in supply chain and logistics program maintains a partnership with the Upper Great Plains Transportation Institute. Applicants must have a bachelor’s degree from an accredited institution and a minimum 3.0 cumulative GPA. Applicants who do not meet the GPA requirement must submit GRE or GMAT scores. All applicants must submit a two-page resume, a letter of intent, three letters of recommendation, and official college transcripts. North Dakota State University is regionally accredited by the Higher Learning Commission (HLC). 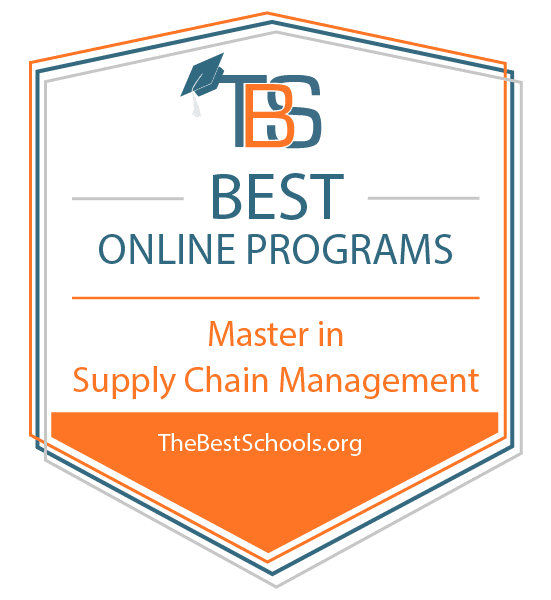 Georgia College and State University ranks among The Best Online Master’s in Supply Chain Management Programs! Georgia College, a public liberal arts school located in Milledgeville, offers a fully online master’s in logistics and supply chain management. Students can complete the 30 required credit hours while meeting existing obligations. Students must pass statistics before beginning major coursework, which covers topics like logistics processes and management, inventory control, logistics leadership, and international trade. Elective options include information technology, commercial law and regulation, strategic operations management, and integrated accounting. Applicants must have a bachelor’s degree from a regionally accredited institution and must submit GRE or GMAT scores, official undergraduate transcripts, and a resume. In some cases, Georgia College waives the standardized test score requirement for applicants with considerable professional experience. Each semester, select students participate in graduate assistantships, during which they work 10 to 20 hours per week within the department in exchange for tuition assistance and health insurance. All students earning the supply chain management master’s degree online pay the same tuition rate, regardless of residency. Georgia College is regionally accredited by the Southern Association of Colleges and Schools Commission on Colleges (SACS). Adelphi University ranks among The Best Online Master’s in Supply Chain Management Programs! Students can complete the flexible MS in supply chain management at Adelphi University on a full-time or part-time basis. The synchronous online classes are available mostly in the evenings. Students near the university’s campus in Garden City, New York, can pursue the degree in a blended format. The curriculum comprises six credits of foundational courses, 15 credits of major courses, 12 credits of electives, and a three-credit capstone. During the capstone, students examine case studies from across the industry to advance their knowledge of strategic management principles and practices. Applicants to the online master’s in supply chain management program must submit a 500-word personal essay, at least one letter of recommendation, a resume, and GMAT or GRE scores. Applicants must hold a bachelor’s degree from an accredited institution and must provide college transcripts. All online students pay the same per-credit tuition rate, regardless of residency. Most students complete the program in two years; however, completion time depends on the number of credits taken per semester. Adelphi University is regionally accredited by the Middle States Commission on Higher Education (MSCHE). The business school holds accreditation from the Association to Advance Collegiate Schools of Business International. University of Wisconsin - Whitewater ranks among The Best Online Master’s in Supply Chain Management Programs! UW-Whitewater offers an online MBA with a specialization in supply chain and operations management that emphasizes global thinking, ethical behavior, and innovation. Students improve their decision-making and project-management skills and use creative and critical-thinking skills to address issues in the field. Students develop a solid business foundation through their coursework, including classes in business valuation, leadership development, negotiation strategies, project management, and strategic technology. Supply chain management courses include global operations management, operations strategy, quality control, and the management of innovation. All online students pay the same tuition rate, regardless of state residency. Applicants must provide GMAT or GRE scores. UW-Whitewater assigns each applicant a composite score based on their standardized test score and undergraduate GPA. The program requires a minimum composite score for admission; however, the university may admit students who fall below the threshold if they have significant professional experience. The University of Wisconsin Whitewater is regionally accredited by the Higher Learning Commission (HLC). The College of Business and Economics holds accreditation from the Association to Advance Collegiate Schools of Business. Portland State University ranks among The Best Online Master’s in Supply Chain Management Programs! PSU’s online master’s in global supply chain management is the only degree of its kind with approval from the Institute for Supply Management. Students complete 52 credits over six trimesters, and most graduate in 21 months. Students earning the master’s in supply chain management online benefit from the university’s industry partnerships with retail and global manufacturing companies. Students become experts in emerging technologies impacting supply chains, including trends in online shopping and sustainability. Students participate in a field study experience in Asia, during which they work with international supply chain and logistics leaders. The curriculum covers several topics, including strategic sourcing and forecasting, data analytics, contract negotiation, and project management. Students can begin the program during the fall or spring, and all coursework is available online. Applicants must submit undergraduate transcripts, a resume, a statement of purpose, and two professional references. Applicants must have a bachelor’s degree and at least a 2.75 undergraduate GPA. Portland State University is regionally accredited by the Northwest Commission on Colleges and Universities (NWCCU). PSU’s School of Business Administration holds accreditation from the Association to Advance Collegiate Schools of Business. University of Alabama in Huntsville ranks among The Best Online Master’s in Supply Chain Management Programs! Founded in 1950, UAH is a public university that serves more than 8,400 graduate and undergraduate students. Designed for professionals who want to advance their careers, the online master’s of science in supply chain and logistics management program at UAH produces strategy-driven industry leaders. The program’s curriculum emphasizes skills relevant to modern business and supply chain practices. The online master’s in supply chain management requires 30 credits, and students can begin the program in the fall, spring, or summer. Full-time students typically graduate in one year. Students gain the knowledge and skills necessary to make significant contributions as supply chain professionals. Coursework covers several subjects, including modeling and interpreting data related to supply chains, improving efficiency, strategic decision-making, and emerging technologies. Applicants to UAH’s graduate programs submit undergraduate transcripts and GRE or GMAT scores. The university encourages prospective students to apply for financial aid when they submit their program application. UAH requires no minimum GPA or standardized test scores. The University of Alabama in Huntsville is regionally accredited by the Southern Association of Colleges and Schools Commission on Colleges (SACS). The business school holds accreditation from the Association to Advance Collegiate Schools of Business. Loyola University Chicago ranks among The Best Online Master’s in Supply Chain Management Programs! Loyola offers a fully online MS in supply chain management designed for both established professionals and those entering the industry. The program covers topics including logistics, transportation, distribution, warehousing, and purchasing on an international scale. To date, every program graduate have secured employment within one month of graduation. The online supply chain management master’s program includes classes in purchasing and inventory management, global logistics, business ethics, and managerial statistics. Students complete a capstone during which they apply classroom knowledge to an industry problem and develop solutions based on research and practical skills. Applicants must have a bachelor’s degree from an accredited institution and must submit transcripts, two letters of recommendation, a personal essay, a professional resume, and GRE or GMAT scores. In-state and out-of-state students pay the same tuition rate. Loyola University Chicago is regionally accredited by the Higher Learning Commission (HLC). The Quinlan School of Business is accredited by the Association to Advance Collegiate Schools of Business International. The online master’s in supply chain management program holds a STEM designation from the U.S. Department of Homeland Security. Earning a master’s in supply chain management online can mean pursuing an MBA with an emphasis in supply chain management, a master’s in engineering with a concentration in supply chain management, or a master’s in supply chain management. At some schools, students can enroll in a joint degree program, earning complementary master’s degrees. Regardless of the degree title, students studying supply chain management learn about global supply chains, strategic sourcing, transportation engineering, integrated management, and quantitative methods for logistics. Some programs allow students to tailor curricula to meet individual academic or professional goals while others offer pre-designed tracks such as retail, risk, or analytics. Most schools' curricula include a practical internship component and a capstone project. Colleges and universities differ in the focus of their supply chain management programs. For example, some schools emphasize global supply chains and, therefore, offer courses like principles of strategic global sourcing. Other schools make logistics the core of their curriculum and, thus, offer international logistics management. Still, other schools may stress the digital supply chain. By selecting the school and track that best suits their own interests, students can focus their studies toward their professional goals. Again, while details may vary from school to school, an online master’s in supply chain management can function as an MBA with a supply chain emphasis, a master’s in engineering with a concentration in supply chain management, or a stand-alone curriculum in the supply chain discipline. All of these degrees typically require 30-36 credits and take about 18 months to two years to complete. Below are some sample courses that students can expect to take while earning their degrees. Operations management: Central to modern business processes, operations management is the study of process analysis and streamlining. Students learn how to design and manage operations for business success. They leave with basic knowledge about supply chain management and the strategy of operations. Students who plan to be logisticians or supply chain managers will find this course especially valuable. Supply chain management: Students in this course consider the methods, issues, and strategic framework of supply and demand management. They delve into topics such as inventory control, transportation planning, customer service standard development, warehouse management, and procurement. This course is fundamental to the discipline. Quantitative analysis for decision making: Quantitative analysis courses equip students with the statistical and mathematical tools to make decisions about operations for industrial organizations. Students consider topics like efficient algorithms for supply chain management. This course is critical for students preparing to be operations research analysts. Certified supply chain professional (CSCP): APICS designed the CSCP for supply chain management professionals who hold a bachelor’s degree, have three years of experience, or have gained one of a variety of other certifications. Certified professional in supply management (CPSM): Becoming a CPSM requires three years of full-time professional supply chain management experience and a bachelor’s degree or five years of experience without the degree. Those who wish to be CPSMs must also pass three rigorous exams. The certification indicates a career milestone. Supply chain management is the coordination and integration of information, products, and currency as they move from supplier through wholesaler and retailer to final consumer. People with careers in supply chain management typically have strong critical-thinking and problem-solving skills. They are well-educated in mathematics, systems engineering, and operations. Most of these professionals use computer software to plan, direct, and track product movement. Logistician: Moving products from suppliers to consumers requires analysis and coordination. Trained in supply chain management, logisticians manage this cycle. These professionals work in many industries, including manufacturing, government, and science. Nearly all logisticians have bachelor’s degrees, and many also hold professional certificates or master’s degrees in supply chain management. Operations Research Analyst: Thanks to technological advances, companies of late have compiled rich and extensive data banks that need operations research analysts to make sense of what they know. Operations research analysts spend their days collecting information, analyzing it, and using it to solve problems. They weigh the costs and opportunities of their solutions and make recommendations to advisers. Industrial Engineers: Industrial engineers devise systems that help minimize or eliminate waste in production processes. They are efficiency experts who work in transportation or computer equipment manufacturing. The occupation requires a bachelor’s or master’s degree with a heavy emphasis on math, computer science, and hard sciences. Many schools offering online supply chain management master’s degrees make the completion of said degrees fast and straightforward. Every program, however, does not result in improved career opportunities. Therefore, it is important to review a school’s accreditation to identify questionable programs among legitimate ones. Schools offering an online master’s in supply chain management should hold membership in a regional accrediting association. These include the Middle States, Western, and New England Associations of Colleges and Schools, the Northwest Accreditation Commission, and the Higher Learning Commission. A college or university seeks national accreditation to show it abides by standards of academic integrity and quality within a particular field. While many nationally accredited schools are technical or vocational, large universities may also hold national accreditation in addition to regional accreditation. Employers may look for graduates of schools with both types of accreditation. The Association to Advance Collegiate Schools of Business is a well-regarded private organization that provides national accreditation to supply chain management programs. Professional organizations in supply chain management give students and recent graduates a chance to take advantage of networking opportunities, annual conferences, career services assistance, and education programs. These organizations offer peer-to-peer research opportunities, expert insights, and the dissemination of new knowledge in the field. Not only do many organizations provide online job boards, but some also offer career coaching from seasoned supply chain professionals. Ultimately, these organizations help expose the wider business community to supply chain management principles and practices. Institute for Supply Management (ISM): With 50,000 members in 100 countries, ISM advances supply chain management through conferences, education, certification opportunities, and a unique ISM Mastery Model. Within this model, teams can select from six competencies and 69 sub-competencies to cover specific gaps. Council of Supply Chain Management Professionals (CSCMP): CSCMP represents more than 100,000 professionals in supply chain management. It provides an annual State of Logistics Report, an academic research symposium, conferences, awards, and SCPro certification. APICS: Offering educational opportunities, certifications, and networking events, APICS accepts professional, young professional, and student members. The organization boasts more than 45,000 members in 100-plus countries, and it hosts a leading supply chain management conference.